Late last week, Walmart announced their new Connected Content Partner Program, which features Salsify and 11 other technology partners. While the program doesn’t launch until January 2019, we wanted to give brands the inside scoop on what happened, why, and what it means for Walmart suppliers. In April, Walmart issued a Request For Proposal (RFP) to all of its Content Service Providers (CSPs). As part of the process, Walmart spoke to more than 650 of its suppliers and identified product content delivery as a key source of friction in its digital commerce strategy. 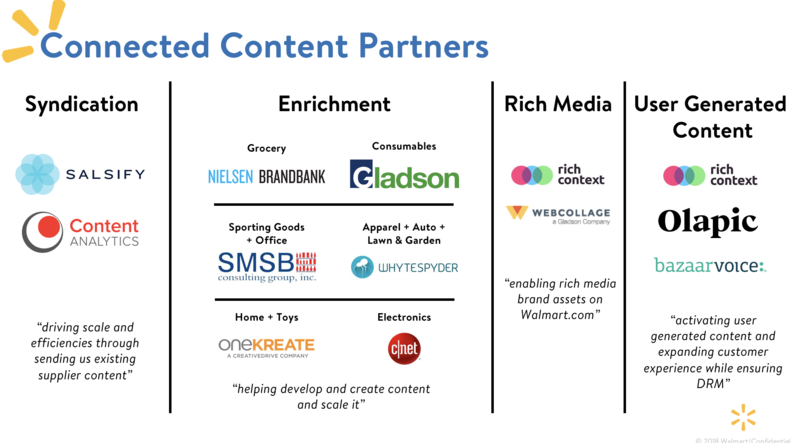 Following extensive meetings with over 30 CSPs, Walmart cut the original CSP list by about 30% and released their newly termed “Connected Content Partners” that includes Salsify, one of the only two pure syndication providers invited into the program. Why the new partner program? The Connected Content Program aims to provide Walmart suppliers with the technical experts who can help scale digital product content to Walmart's catalog and other retailers at a lower cost. Ultimately, Walmart’s goal is to help suppliers better navigate the product content syndication process faster and more efficiently. Six years ago, Walmart founded their Content Service Provide program. Since its inception, the number of Walmart CSPs has grown quickly, leaving Walmart with a large number of service providers, with varying functions and standards. In order to streamline the delivery of product content from suppliers and give them more flexibility. Walmart looked to invest more deeply in their partner program. To facilitate this goal, Walmart decided to re-evaluate their existing CSP program, reduce the number of partners serving suppliers, re-organize the vetted partners into functional disciplines (syndication, enrichment, rich media, and user-generated content), and roll out a program focused on maximizing supplier-technology partner relationships. What does this mean for Walmart suppliers? When you get down to brass tacks, not much has changed for suppliers, today... Any CSPs that were providing content to Walmart under an existing arrangement will still continue to operate under that same agreement. Continuing with Walmart’s agnostic, open ecosystem philosophy, their API will remain open source, however, going forward Connected Content Partners will have exclusive privileges and access to Walmart. Salsify will have extended resources and visibility into Walmart processes, as well an on-site presence at Walmart to ensure our customers have expedited support in resolving any issues. Salsify is one of two pure syndication providers in the program-- and the only Product Experience Management platform. Salsify’s selection is a testament to our industry leadership and the strength of relationship with Walmart, as well as Walmart’s belief in peer-to-peer software solutions as the future of ecommerce. "This program is the evolution of our Content Service Provider (CSP) program to provide harmony between retailers, suppliers and content," said Frank Ogura, Staff Product Manager at Walmart. "With our syndication partners, we believe they will help suppliers deliver content with speed and agility." To learn more, check out the press release on the announcement here.